I mentioned a little while back that since I’ve started being just a tad obsessed with all things skincare and beauty, certain aspects of that have been rubbing off on my boyfriend. Now I’m not complaining, in fact it’s quite fun hearing his take on the face mask I’m currently loving, and his innocent queries of ‘will this work on guys skin?’ And although I originally used to laugh and tell him that it wouldn’t make any difference, I’ve recently noticed him being more adventurous with the skincare he purchases. This has lead me to wonder which products are the ‘male equivalent’ of some of my favourite products. We both have combination / oily skin so although my skincare does work for him to, he much prefers having something all to himself, and with somewhat more masculine packaging! 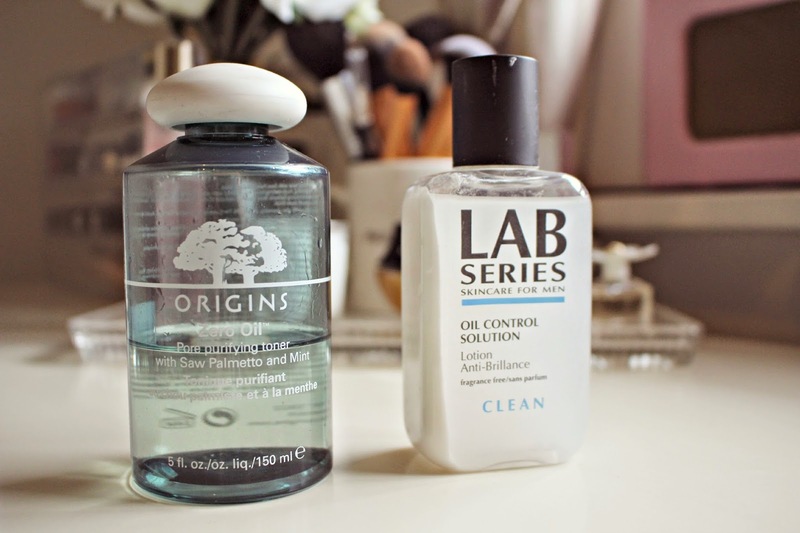 One of the first products which I’ve heard him rave about is the Lab Series Oil Control Solution which I think has similar results to my beloved Origins Zero Oil Pore Purifying Toner. Charlie says his skin is clearer in the long run when he uses this regularly, and it’s also fine to use after shaving as it doesn’t contain any irritating ingredients but his only complaint is the small bottle. For £19.00 (from ManKind), the bottle could contain a little more of the solution, especially as it’s hard to control how much comes out of the bottle onto the cotton pad! As for me, I’ll be sticking to my Origins Zero Oil Purifying Toner which I reviewed previously here, which contains 50% more liquid, and is just a tad cheaper too. If you want to stop your man from pinching your skincare, then I hope you’ve found this post useful! Let me know if you’d like me to do more posts about men’s skincare! Does your boyfriend use skincare products?